One in four high school seniors in Spokane County use an e-cigarette, according to the Spokane Regional Health District. It's almost like a game. Students, with their silent, easily concealed e-cigarettes are vaping all around the school. School officials, meanwhile, try desperately to stop them — sniffing out the flavors, checking the bathrooms and delivering harsher punishments. But so far it's a game schools are losing. Students might get caught now and then, but school administrators and public health officials still describe how kids vape — or "Juul," to some — all over school grounds. They vape in the hallways, in the cafeteria or in the bathroom. They vape during class, staring straight at their teacher and blowing the vapor into the sleeve of their shirt, undetected. They send each other messages on Snapchat of friends vaping in school to laugh at. At Lewis and Clark High School, administrators closed a bathroom because too many kids were vaping in it. "Due to continuous vaping, this bathroom will be closed until further notice," a piece of paper said. The students mocked it: "Due to an ignorant school system lacking resources we have turned to nicotine to cope with anxiety and stress brought on by your curriculum." Kids then took a picture and spread it on Snapchat. Yes, for teens, vaping is cool. While youth drug use is down in Spokane County, and youth cigarette use is at an all-time low, the use of e-cigarettes by youth has reached "epidemic proportions," according to a forthcoming report from the Spokane Regional Health District. About one-in-four high school seniors in Spokane County used an e-cigarette in 2016, the most recent year data is available. The devices are appealing to kids, and not just because companies like Juul make them easily concealed with flavors that taste like candy. They also lack the horrible smell of a regular cigarette. And they seem safer than cigarettes, though that's an extremely low bar to meet. For teens, it can be a way to rebel in what they think is a relatively harmless way. "I think that's really what it is. We want to grow up faster, and we're not allowed to do this, so we want to do it," says Cheyenne Jones, an 18-year-old senior at North Central High School. Not Jones, to be clear. Jones, student advisor to the Spokane Public Schools Board of Directors, has resisted the trend. Concerned for her classmates, she's partnered with the district to find ways to stop it. The district, like those all across the country, is scrambling to keep up. Spokane Public Schools so far has taken a more educational approach when a student is caught vaping. Other districts like Coeur d'Alene Public Schools have taken a strict "Zero Tolerance" policy, slapping kids with a three-day in-school suspension and a $74 fine on first offense. Neither approach, it seems, has yet to overcome the addictive powers of nicotine. "In like 10, 20 years, we're gonna see the side effects of doing this every day and what happens to someone's lungs and their body and their mind," Jones says. "I don't think kids know how addicting it is." Since Jones brought up her concerns with vaping during a school board meeting last month, the district has been exploring the extent of the problem and how to fix it. It's not new for schools to deal with these types of things, says Shawn Jordan, director of secondary curriculum for SPS. "I graduated from high school in the early '80s. Chew was the big thing then. Cigarettes were the big thing," Jordan says. Yet the vaping devices present a different kind of challenge. Kids can get their nicotine fix anywhere, if they're sneaky enough. Juul devices, which look like USB storage devices, make that easier. That's why it's possible for a student to Juul in class with the teacher left clueless. For Jordan, the prevalence of e-cigarettes has been shocking. Even though it's easier to conceal, students who are perhaps more brazen with their vaping get caught left and right. In the 2016-17 school year, between Spokane Public Schools and Central Valley School District, there were 212 incidents related to tobacco or vaping. It was a pretty high number at the time, but it doesn't compare to what schools are seeing today: Between the two districts — after just a few months of this year — there have been 266 incidents. The vast majority involve vaping, not cigarettes, districts say. And it's not just high school kids. Even elementary school children are vaping. Spokane Public Schools already caught it happening 11 times this year. Washington state law allows for a $103 infraction for kids 16 or older caught vaping. But school resource officers in Spokane Public Schools have resisted issuing such citations. The district is in active discussions about starting to do so. "It's one that we're talking about," Jordan says. "There's lots of implications to that." Instead, students serve in-school suspension, or lunch detention. There, they get information aiming to make them think twice about vaping. Still, some students remain skeptical. They know that cigarettes are bad. But e-cigarettes? Kids think they're better. School officials have a hard time arguing with that, especially with a lack of research out there on the long-term effects of vaping for youth. "That's what makes it challenging," Jordan says. "We don't have the research to back it up. All we can message is that we don't know and that it potentially could have harmful effects." So what exactly is the problem with kids vaping? There's the nicotine, for one. For a child's developing brain, nicotine impacts cognitive development, attention and their ability to comprehend or retain information. Plus, it's highly addictive — much more so than, say, caffeine, says Paige McGowan, a prevention specialist with the Spokane Regional Health District (SRHD) focusing on tobacco, vaping and marijuana. It can also increase the risk for heart disease. "If the youth just used nicotine, there'd still be cause for concern, just because of how hard it is to quit it," she says. "The sheer amount of e-cig users is as much of a concern [as cigarettes] in and of itself." The bigger questions lie with what else vaping products contain. 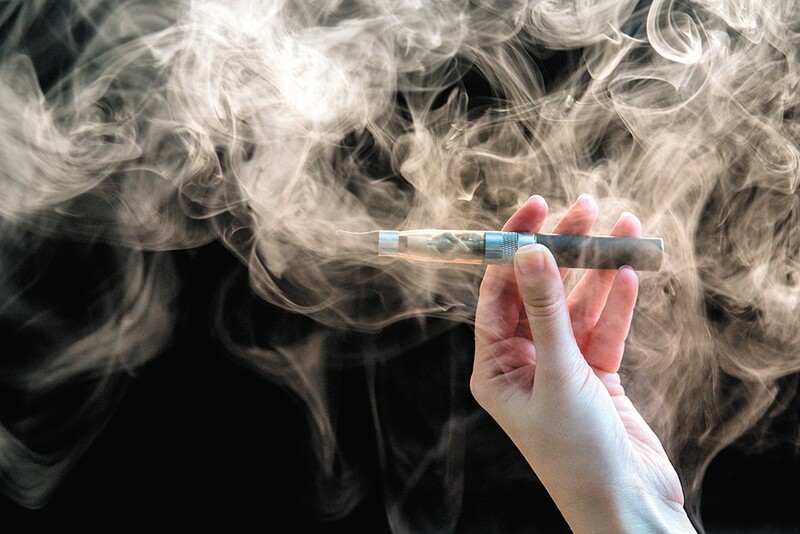 Some e-cigarettes (notably, not Juul), contain diacetyl, a chemical that studies have linked with a condition called "popcorn lung," which damages a lung's airways making it difficult to breathe. But there's much more diacetyl in actual cigarettes, and even then, research is unclear on if smoking actually causes popcorn lung. Research from Georgetown University has found that not only did cigarette use decline as vaping increased in popularity, but that 6.6 million cigarette smokers could gain 86 million years of life if they smoked e-cigarettes instead. That doesn't necessarily mean cigarette-smoking kids are switching to vaping. Many start with vaping, and some research has shown that those young people are more likely to transition to cigarettes and become smokers. And, in case it wasn't clear, a lot of kids are vaping. "The sheer amount of e-cig users is as much of a concern [as cigarettes] in and of itself," says Ashley Beck, SRHD data research scientist. At some point, as young e-cigarette users grow older, the record-low number of cigarette users might trend back up again, Beck says. Either way, there will likely be a generation of children addicted to vaping, and nobody knows exactly what that means. "What's missing is research on the long-term use of e-cigs, specifically," Beck says. If parents or students still aren't convinced, however, then schools have one more card left to play when trying to stop kids from vaping during class: It's illegal. While Spokane Public Schools has so far stuck to education instead of citations for vaping at school, other schools in the county go further. Most other districts in Spokane County, including Central Valley, contract with the Spokane County Sheriff's Office to provide school resource officers. And they're no longer holding back when it comes to issuing citations, says Sheriff's Office public information officer Mark Gregory. "That kind of talking [education] isn't necessarily working, so SROs are all going to start taking enforcement action, either through the school and/or writing tickets," Gregory says. In Coeur d'Alene, the "zero tolerance" policy that calls for a three-day in-school suspension along with a citation came in response to rampant vaping problems. The policy was implemented on Oct. 1, but it remains a major issue. Lake City High School, for example, has issued 38 tickets for vaping (along with the suspension), and that includes five just in the last week, says Coeur d'Alene Public Schools spokesman Scott Maben. Last month, the Food and Drug Administration announced it would restrict access to flavored e-cigarettes. Juul, meanwhile, announced around the same time that it would stop selling its flavored pods except for mint, menthol and tobacco flavors. Vaping devices present other safety challenges, too. If the liquid gets on someone's skin, it can be extremely dangerous. The larger tank-looking ones called "mods" have been known to explode on occasion. Gregory, with the Sheriff's Office, says one of the resource officers locally thinks — though he can't prove — that someone vaping set of a smoke alarm at a school. Ultimately, just as with education, it's unclear if stricter punishment has deterred any kids from vaping. Jordan, with Spokane Public Schools, says everyone has to remember that this is an addiction kids are dealing with. He says it really comes down to students. If they see a fellow student see something, then they should say something, to them and to an administrator. Jones, the senior at North Central, says she's tried to speak up when she's seen a classmate vaping. The original print version of this article was headlined "'Epidemic Proportions'"